Yesterday, I visited my great grandparent’s home in Clyde River for the first time in my life. I grew up in Clyde River and spent a great deal of time at my Grandfather Beer’s which was just the next farm to ours and also at my Grandmother MacLean’s in Meadowbank, but our connection with the Darrach’s was not part of our daily life. The Darrach’s were a series of cousins including those “once removed” that we would meet on an occasional visit and at weddings, wakes and funerals. The reason was many of them had moved out of the community or died off. The homestead and farm were owned by Darrachs up until the 1980s and a small portion of the original farm is where John and Mary Darrach’s great granddaughter Doreen (Beer) Pound and her husband Jim live now. Sidney Poritz has owned the Darrach homestead for the past 22 years. His sister Lily Poritz Miller is visiting him for a few days, and it was good to see her again after her book event at J’Nan Brown’s last summer. Sidney and Lily grew up in South Africa leading up to World War II which is well accounted in Lily’s book, In a Pale Blue Light. As I walked around the old Darrach property and through the old house with Sidney, I could say we had very little in common, as we didn’t share a similar history where our language and sensibilities are rooted. But as foreign as Sidney and Lily’s history was to me, the home in which they were living was immediately familiar. The kitchen felt the same as my Grandfather Beer’s kitchen with a wood stove, a kitchen table by the window and a big chair where the man of the house would sit. There was no big chair for the woman of the house, as she would be busy in the little pantry at the back off the kitchen that featured a storage closet for food under the stairs. Sitting in the kitchen, I saw the vent in the ceiling above the wood stove allowing the heat to warm the upstairs. We had one in my family home, and when my parents were entertaining company and I was sent to bed for the night, I would sneak into their bedroom above the kitchen and lay on the floor beside the vent and listen to the conversations adults had when children had left the room. Looking at the old windows in the kitchen, I was reminded that the original construction of these homes was never suited to the harsh cold winters and strong winds of Prince Edward Island. Our ancestors only had a knowledge of Scottish winters when they built these homes; their innocence was no match for PEI in January and February. In the front parlour which would have been the least used room in the house, there was a mantle where possibly a wood fireplace or parlour stove once resided. This room would have shown the possible sophistication that could be summoned if the occasion arose, but practically, it would have provided a place to entertain a Presbyterian minister or to “wake” the dead. In the hallway was the same black grated furnace that we had, where you would stand at night to get warmed up before going to bed. Off the hallway was a sun porch that offered an additional place to sit in the summer months, although I am not sure who had time, possibly the people home from the States. Of course, I knew there was a back bedroom on the first floor. Both my grandparents’ places had one, and it was where the older folks slept when they could no longer make the trip up the stairs. Standing upstairs in the hallway was exactly like my grandmother’s home with a window at the front and a chair where nobody would have time to sit and two bedrooms on each side. One of the upstairs bedrooms is now converted into a bathroom, and the storage place off the pantry downstairs is a second bathroom. In-door plumbing would not have been a technology known to the Darrach family with their 9 of 11 children who were healthy enough to live past infancy. When I think of what life was like for my Darrach ancestors in making a living off the land and the river, I couldn’t help but think of what these staunch Presbyterians would think of a vineyard now growing on their homestead. 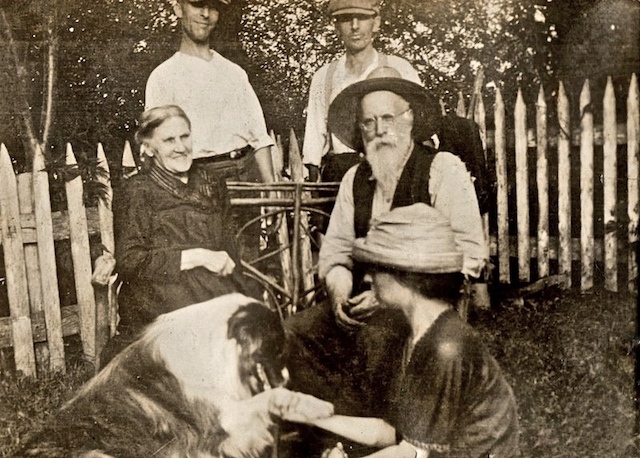 Our ancestors came to Prince Edward Island to make a better life for themselves and produced many children to share in their labours and dreams. It was bred in their bones to go where you needed to make a living, and so these children and their children’s children moved on just like they did, some within the community and others to the Boston states and to the West where there was further education and work. Great grandchildren moved to Central and Western Canada. Sidney and Lily’s family moved from South Africa to Massachusetts with a promise for a better life for their family after the death of their father. So even though we had difficulty in finding a common language as we walked around the old place, the events of history had forced both our ancestral families to leave everything and move to an unknown place with the hopes that things would be better. The Darrach’s are not farming here anymore, but the land stands proud and is impeccably maintained because a widowed mother from South Africa did make a better life for her children and her son could acquire this beautiful piece of land in Clyde River. Sidney’s vineyards feature red hybrid grapes that include Leon Millot and Marechal Joffre. A white hybrid grape L’Acadie Blanc will be ready for winemaking next year. All these varieties have already proven to grow very well in Atlantic Canada. Vines require four years of growth before the grapes are ready. This setting that offers South and East exposures and the proximity to the river is ideal for the vines as it provides additional light and warmth. There are two vineyards, the more mature one to the west of his house and the newer one other to South. At this time, Sidney has no plans to make wine on the property, as he is refining his knowledge on the art of growing vines. But considering his keen abilities, I am sure it would be possible. Thank you to Sidney for sharing this serene setting by the river with us. As I look back through my notes from Jon Darrach, I see where he mentioned that the Darrach family raised another child at the request of the local minister and he was called Dinny Darrach. He moved to Texas to try cotton farming but was wiped out during the depression. He eventually settled in Upstate New York where he had a vineyard. Vivian, this is a wonderful piece and I especially love the picture of your grandma. It’s such a beautiful spot and the fact that all those children grew up in that small house, that’s a wow. Thank you for this fabulous article about our family history…. Thanks, Debby. It is a wonderful place and so beautifully maintained. Was this house not also owned by one of the MacNeil boys during the eighties? I seem to remember babysitting in this house. Excellent, I look forward to seeing it.